Ecosse Symphony was designed to realise the full potential of high resolution music, available in 0.5m, 0.8m, 1.0m or 2.0m lengths with RCA or XLR plugs. To enjoy the full quality of high res audio files, with their wide dynamic range and extended frequency response, requires an interconnect which exceeds the requirements of the SACD/DVD-A format. Conceived and designed as an upgrade to the world renowned and multi-award winning Ecosse 'Maestro' MA2 Interconnect (a bloody hard act to follow…) 'The Symphony' is an all-new 'balanced' analogue interconnect cable which easily exceeds these requirements. This remarkable interconnect uses several complementary sub-topologies synergised in one cable. Space and secrecy preclude a detailed description but we can afford a brief glimpse in lieu of an audition. The conductor is UHP-OFC (Ultra High Purity Oxygen-Free Copper, plated in UHP-OFS (Ultra High Purity Oxygen-Free Silver-since silver has a 10% gain in conductance compared to copper, a copper wire plated with silver will have less signal loss especially at longer lengths) spirally wound around a PE (polyethylene) tube with a primary dielectric of gas-foamed low-density polyethylene (LDFPE). Each conductor assembly has a continuous foil shield and drain wire. 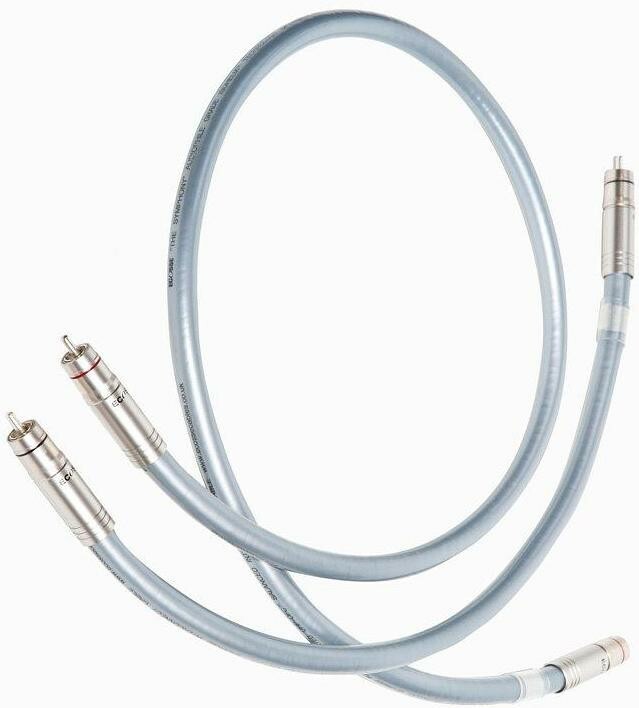 Isohelix is the patented technology for ensuring not only that the signal and return conductors always maintain a precise relationship to each other, but also that externally induced resonance (microphony) is entirely dissipated within its structure, thus fully isolating the conductors from the outside world. A further continuous foil shield and drain wraps the encapsulation before sheathing in soft PVC. When wired in a 'pseudo-balanced' fashion using RCA 'phono' connections, the screen is connected at one end only to drain unwanted 'noise' RFI. Here the termination is MACH2XS Audiophile deep silver-plated non-compressing all-Copper RCA plugs - where the centre pin and shields (designed to form a 'Faraday Cage'- a device designed to maximise RF screening) are built from copper materials. For fully balanced equipment, 'The Symphony' is fitted with Audiophile quality MACH2-XLR Switchcraft plugs which have deep silver-plated pins and solder surfaces. The unique clamping mechanism exerts equal pressure around the circumference of the cable without compression. This ensures a constant impedance from termination to termination and results in an almost perfect signal transfer. The Symphony, single-ended or balanced, produces a soundscape from an inky blackness that converts your listening room into the recording venue. This interconnect, due to its construction, is directional and an arrow indicates the appropriate direction (RCA). We sincerely recommend you match this cable with one from the Ecosse Monocrystal 'speaker' range but, for the ultimate audio experience at this price point, try it in combination with Ecosse MS4.45 pre-terminated biwire. Available in 0.5m, 0.8m, 1.0m or 2.0m lengths.